If you’re a die-hard fan of the Planters icon Mr. Peanut, you might just be a member of the Peanut Pals. Founded by Judith Walthall in 1978, the Peanut Pals is a non-profit club organization for Mr. Peanut collectors. If you love to collect Mr. Peanut memorabilia, you’d be right at home alongside the 400+ members that have been meeting up for conventions each year since 1980.
Who better to talk to about Mr. Peanut’s fan club than Scott Schmitz, President of the Peanut Pals? We chatted with him about how he landed such a cool gig, why collecting Mr. Peanut merch matters from a historical perspective, and how you can join the crew and become a member. AW: Scott, you’re the current President of Peanut Pals. How did you get involved? SS: I went along with my dad to a community yard sale in Brillion, WI in 1976. He found a Mr. Peanut pot metal statue and thought it was cool. My parents started collecting and had two shelves of Mr. Peanut items in a china cabinet — pretty cool if you think about how this was before the Internet where there was not a lot of merchandise to be found in Wisconsin! AW: What do you love most about Mr. Peanut? What do you think it is about the icon that endears him to so many across generations? SS: Mr. Peanut has been around over 100 years. He was well advertised in the first 80 years in print and in free merchandise. Mr. Obici and Planters sold the product as a quick food for pep, and attracted kids to eat the product with all the free items that you could send for with a few empty peanut wrappers. Since the kids grew up on the product, they continued to enjoy the same as adults. As for me, I enjoy all that Mr. Peanut does. If you look at his advertising through the years, he is athletic, dapper, knowledgeable, hip, and chic with the times. Mr. Peanut is fluid in that he keeps up with the changes in the world — keeping in mind that his character is over 100 years old. AW: Does Mr. Peanut make an appearance at the conventions? SS: Mr. Peanut always makes an appearance as we have thousands of items offered up for sale at every convention with swap meets, room hopping, and auctions. Many of us have parade costumes from the 1940s to the 1980s, and at least one costume makes a trip to the convention so someone can volunteer to put it on and we can take photos with him. 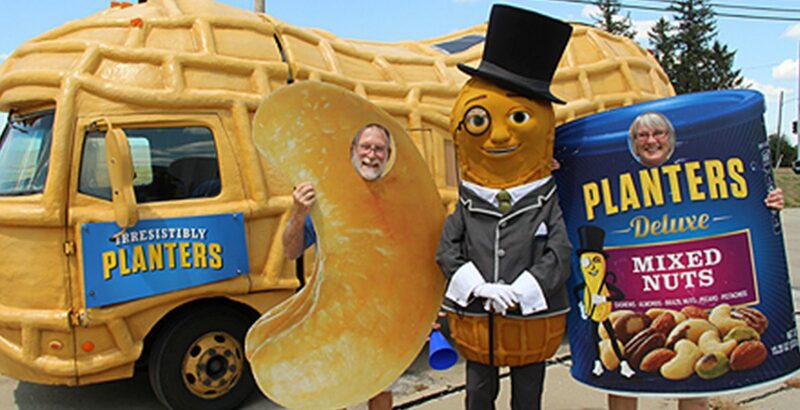 In the past five years, Planters has been sending the Nutmobile and their Mr. Peanut to our events, conventions, and other Peanut Pal events. Peanut Pals enjoy the nutty legume, and we are here to promote Mr. Peanut via our conventions, displays, museum shows, and the Suffolk Antique show (where Mr. Peanut was “born”). AW: What’s the most unusual thing to happen at the conventions so far? SS: In my opinion, the best event I have been a part of in the past 20 years was our Philadelphia convention a few years back. The Nutmobile and Mr. Peanut showed up at the house of our hosts, Lenore and Tony Scola, and then drove us around Philly to stop at the Art Museum. We all walked up the Rocky steps with about 10 of us Peanut Pals in our parade costumes. The public loved it! AW: Let’s talk about the merchandise? What is considered to be “rare” Mr. Peanut merch? How can you tell if you’ve spotted fake Mr. Peanut memorabilia? SS: The club will definitely help you identify fake merchandise. Besides the conventions and people, that’s one of the main reasons to join the club. We have a wealth of information and as many of us say if you like it and the price is right, there is nothing wrong with buying a fake to have in your collection. For rare items, it depends upon the person. I believe the most rare items are those from the Planters stores. When the stores were sold to Standard Brands in the early 1960s, Mr. Peanut went from a realistic-looking peanut man to a cartoonish blue and yellow figure. As part of that transition, Planters destroyed a lot of merchandise in the stores since the “old Mr. Peanut” was not part of the sale to Standard Brands. Only a handful of these items survived. Some people collect plastic items, while others like the paper ads, and still others like the cardboard displays and boxes. AW: Any members you would like to call out as Mr. Peanut’s biggest fan(s)? SS: Bob Walthall, one of our founding members, is a big, big fan of Mr. Peanut. All 20 members of our board are our biggest fans. My wife and I are also huge fans. I have been president of the Peanut Pals for four years, and promoted Mr. Peanut and the club as many ways as we can afford — interviews, articles, museum displays, flea markets, and antique shows. AW: A couple of years ago, the Wall Street Journal ran an article about Peanut Pals seeking new Mr. Peanut fans. Since that article went live in 2016, have you seen membership increase among millennials? SS: As people get older and become less involved in the club and collecting in general, membership has continued to decline. We have had success with our website and Facebook pages and have many people that “like” us and we have no clue who they are. I believe that is the direction many clubs will take as time progresses. We will continue to exist as our information to the public is invaluable — for instance, Planters contacts us when they need questions answered about the history of Mr. Peanut — but we may not have three conventions a year as we do now in the future. However, our insight into Mr. Peanut will always be needed. Younger generations do not tend to collect. They may think nothing about spending hundreds of dollars on a new iPhone, but having a $20 Mr. Peanut item is not high on their agenda. But as a source for the sake of history, we are invaluable. AW: Before we go, we want to help boost membership awareness. If you’re a Mr. Peanut fan, how can you sign up to join Peanut Pals? SS: You can sign up to be a member via our website. $20/year gets you a bi-monthly newsletter and access to a mass amount of knowledge — all free for the taking! We also host three conventions each year where items are generally for sale cheaper than what you would find on the Internet. If you collect Mr. Peanut merch or are just interested in the icon, this is a must. Here’s a look at where the Peanut Pals are heading in 2018! Peanut Pals will have an educational display as well as tables of merchandise for sale. Other dealers will also offer antiques and collectibles for you to select from. Register early for a truly wonderful lunch surprise! Plans are still “brewing” so keep an eye out for more information on the Peanut Pals site as it develops! My heart is jumping for joy! I thought I was alone in my obsession☺I’m from philly and can’t believe I missed the convention here.